Part two of "The Faithless" wastes no time putting our favorite Los Angeles transplant in another precarious predicament. 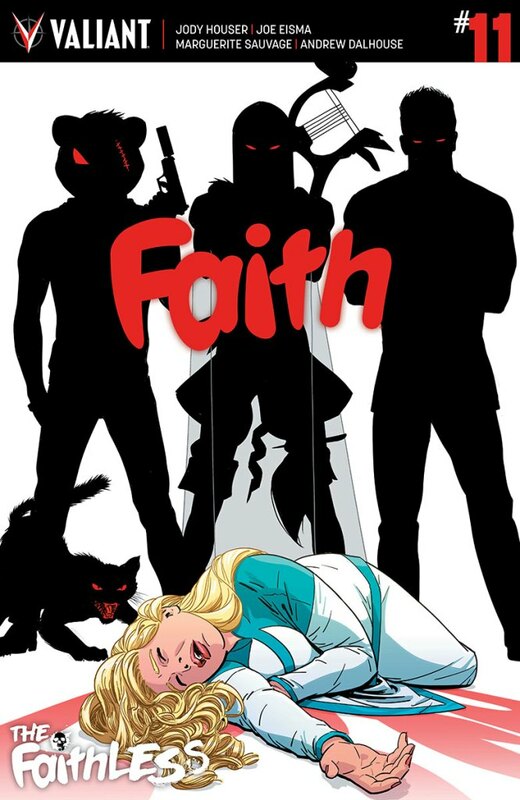 'Faith' #11 is an adrenaline rush and of course, leaves you wanting more. Faith has been holding it down in Los Angeles, stretching herself thin trying to balance her day job at Buzzfeed Zipline and that of superhero. It's starting to take a toll and when things hit the fan she's able to hide behind her alter ego, Summer, in order to find out who's been impersonating her. Enter "The Faithless," a team of past foes who have sworn to take her down. This motley crew includes Sydney Pierce, the magical Murder Mouse, and the power absorbing (feline) Dark Star, led by Faith’s surprising movie star arch-nemesis, Chris Chriswell. They've taken their crime spree to new deadlier heights as people's lives are at stake. Will Faith take the bait and fall prey to The Faithless? Houser ups the pace in this issue as Faith suddenly becomes Richard Kimble looking for the One-Armed Man. There's a sense of urgency and horror as the villains get their stuff together and stop bumbling and start menacing big time. The series takes on a more serious plot that raises the anxiety for Faith and the reader. It's a fast-paced adventure with a cliffhanger that gets its hooks into you. Joe Eisma's beautifully rendered designs with clean lines and expressive faces is a joy to watch even when the baddies twirl their metaphorical mustaches. The bright fun illustrations take the edge off from the more serious scenes but colorist Andrew Dalhouse rightly tones down the colors in light of the violence. Marguerite Sauvage's fantasy sequences also take on a more dour note but her art always looks fabulous. 'Faith' continues to be one of the best comics you can buy as evidenced by its recent Eisner Award nomination for Best New Series. Houser has her foot on the gas in this arc with some truly treacherous territory ahead. You won't find a better comic.